In his Deformation Zone, Johannes Goransson writes of the nature of translation saying in the process of rewriting a text “the ‘meaning’ may have been ‘lost’ but the materiality of the text is brought to life.” Nate Klug, in his latest book Rude Woods (The Song Cave, 2013), embodies this type of translation at its most intriguing and productive. Eschewing the constraints of a strictly “faithful” translation in favor of a more multifaceted dialogue with Virgil’s Eclogues, Klug himself becomes one of the lyrical shepherds he invokes as he responds to the Eclogues which are themselves, he writes, “poems about responding—listening, picking out, and answering back the pleasures of song.” Klug’s brief examination of each of Virgil’s original ten eclogues offers a contemporary take on the pastoral tradition that brings to life both Virgil’s lyric refinement and dynamic content. What we get here are emotion-driven images, but they are not grounded in the typical poetic gesture “I emote therefore my poems have gravity.” Instead, they are vivified by the transformative power of sensual detail. 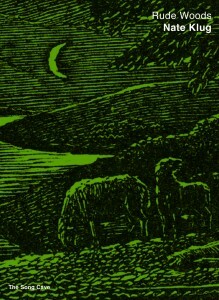 Not only are “wool” and the “earth” and the “you” brought to life for us as readers through the uniqueness of their portrayal, but the portrayal itself is metamorphosing—”Right there in the field, grazing lambs will go red” (from “A Hymn to Prophecy”). But I must admit initial skepticism. A moment of strong lyricism will get my attention but often for the wrong reasons. The lyric, as many writers and readers know, has a tendency to overindulge. An emotive, senses-based series of poems about love and loss and shepherds singing in a flowery pasture could be a hotbed of disastrous pitfalls. But what Klug does well is interrogate these tropes and traditions even as his words participate in them. He creates tension by restraint—not through expected thematic or plot-drive narratives but through the imagistic and sonic qualities of the language itself. In his translator’s note, Klug refers to this quality as “the rough music I sought”; it is “rough”—and “rude” and bitter and bruised. It is also imbued with a “sweetness” and beauty that, in moments, startles with its clarity of vision. It is this complex “song” that ushers forth the unexpected, “unnatural” environment of the new pastoral, a landscape that becomes less of a tangible place of sheep and shepherds, and more of a conceptual space in which sensual experience serves as the landscape itself. Jessica Comola is an MFA candidate at the University of Mississippi where she serves as poetry editor for the Yalobusha Review. Her work has appeared or is forthcoming in Anti-, Redivider, and Everyday Genius, among others.